ORDERING INFORMATION: LBE CD's and t-shirts are available most easily via credit card on the Internet at THE PINK FROST RECORDS STORE (this is a secure site, so shoppers need not fear, and of course your privacy is guaranteed), at gigs, or via mail in the United States (international customers should e-mail the webmaster--link is below--for international postal rates) from Last Burning Embers, 249 Eldridge Street, #14, New York, NY, 10002-1345. Please make all checks and money orders payable to "Jack Rabid". THE NEW FULL-LENGTH CD! Nearly an hour's worth of expansive, burning rock 'n roll that paints a vast swath of sound, from volatile to lush. Available online and postage-paid for $13 from the Pink Frost Records store. Beautiful artwork and a vast lyric sheet included. See the sounds page for MP3's. 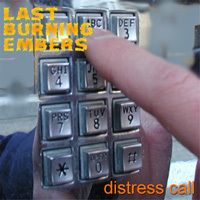 Last Burning Embers debut three-song CD, "Distress Call" (the first version--different from the LESSONS IN REDEMPTION rendition) b/w "Comfort In Misery" and "Cafe Radical", available for $6 postage-paid (US). 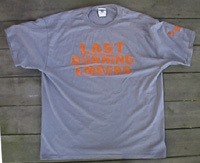 Last Burning Embers t-shirts are now available. 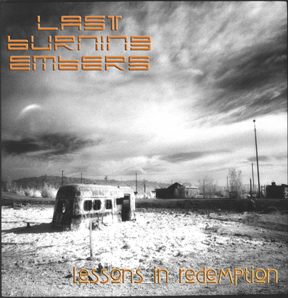 These (quite roughly pictured to the right) are the old design, granite gray in color with "Last Burning Embers" written on the front and the now-defunct "LBE" flaming logo on the left sleeve, both in burnt orange. Sizes are large or extra-large, and price is $10 postage-paid (US).